DS4 is not a large building by the Wharf’s standards, with four of the 19 levels being underground. Two atriums at levels 3-5 and 7-12 help optimise daylight within the building, providing break out space for the tenants. DS4 however brought with it some significant challenges. The top of the Atria requires access, and the make-up of the building façades requires BMU equipment to be able to reach over and under. PTSG supplied bespoke BMUs to both the Atria and the top of the building. 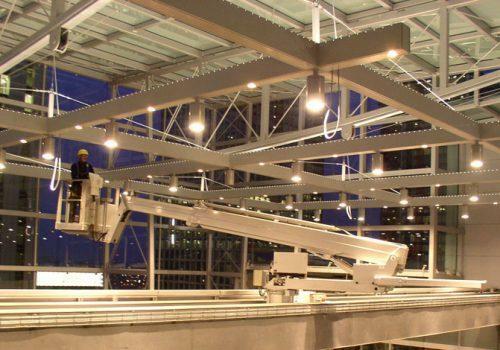 The internal Atria counterbalanced BMUs provide full access for maintenance personnel to the underside of the Atria roof structure. The external BMU was designed to reach over the roof ‘fans’ and then come underneath it, to be able to access the façade. The PTSG solution is simple, but the initial problem was complex.